Whale meet again – and win! Home/Cruise News/Whale meet again – and win! A blue whale has been making thousands of friends this summer – and he could win someone a digital camera. 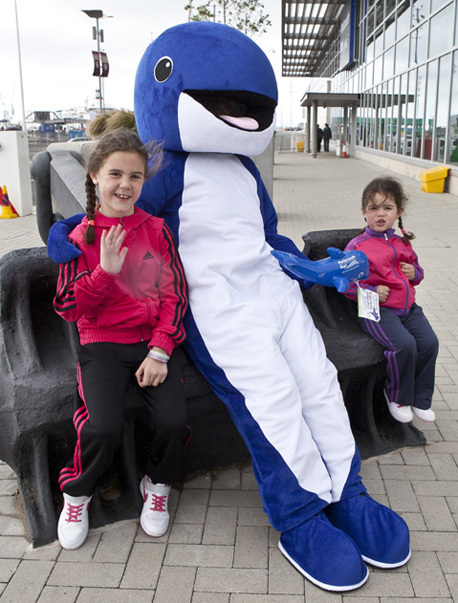 Pip, as he is known, has been adopted as the mascot for Portsmouth International Port this summer, and 100,000 are being given away to passengers passing through the terminal to set off on their holidays, by cruise ship or car ferry. The inflatable creature (not the big furry one in the picture above) has already been seen with Norman knights in Cherbourg, cheering Bradley Wiggins to Tour de France victory on the Champs Elysées, at Mont St Michel, and relaxing on a Spanish beach. Back home, he’s even been spotted at the Olympics, taking a swim past the Aquatics Centre. Anyone with a picture of Pip can post it on Portsmouth port’s website, or via the Facebook page to be in with a chance of winning. The competition is open until September 30 and there are three fun-size Fujifilm cameras up for grabs. Phil Gadd, Portsmouth’s Ferry Port Manager, said “Pip is already a firm favourite, particularly with families heading off on their summer break. Normally we wouldn’t expect to see our passengers’ holiday snaps, but now they’re taking an inflatable Pip on their travels we’re starting to get an entertaining picture of their travels after waving goodbye to Portsmouth”. Holidaymakers heading to Spain this summer can hope to see real whales on their journey and Brittany Ferries now has wildlife officers on each of its crossings to Bilbao and Santander, helping to point passengers in the right direction.